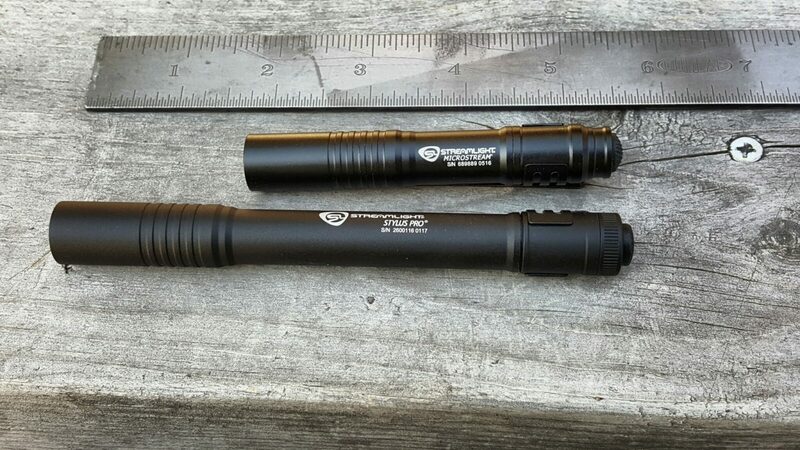 Discussions of various flashlights and lasers used – both handheld and weapon mounted. Okay, I have to admit it up front – I’m nostalgic. When I was a teenager in the 1980s Maglites were a big deal. 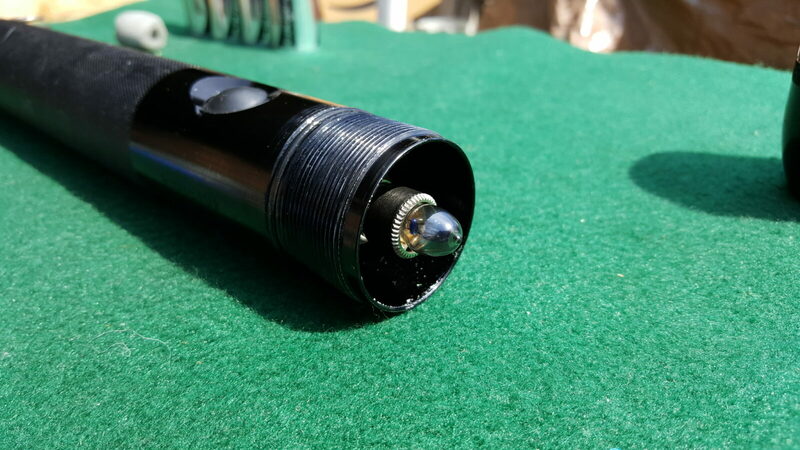 I had a four D-Cell unit and a friend encouraged me to get a Mini Maglite probably in the 1985-ish timeframe and I have used it a ton. 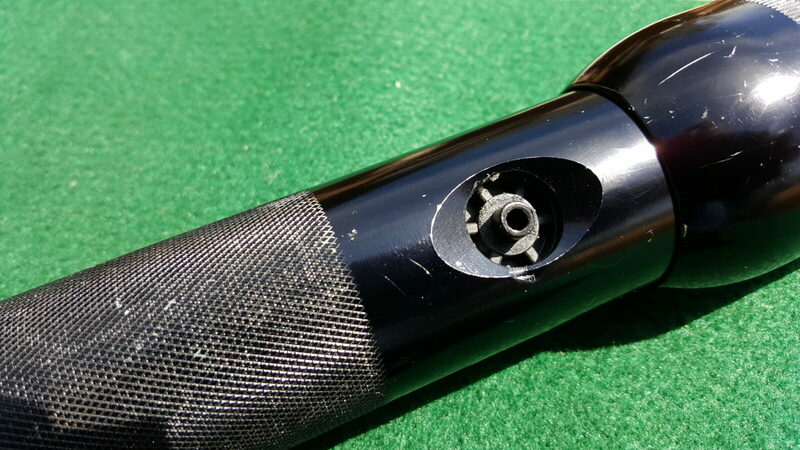 I also bought a Mini Maglite with remote switch and shot gun barrel adapter for my dad. He would slip out the door at night to see what the dog was barking at and would often take a firearm with him – often an old reliable 16 gauge single shot Iver Johnson. It really creeped me out. It wasn’t until years later that I understood how my dad viewed that having both grown up on a rural farm in New Hampshire and serving in the 6th Infantry in Pusan at the end of WWII (Yes, we had troops in Korea towards the end of WWII to prevent the Japanese from returning). 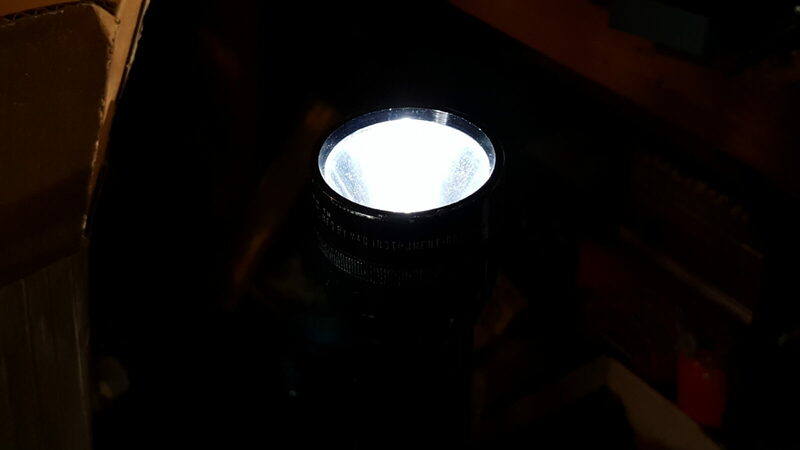 At any rate, I bought my dad a Mini MagLite with a remote switch for that old Iver Johnson and installed it. Years later I would find the shotgun and the light separate – I suspect my dad never really needed it. 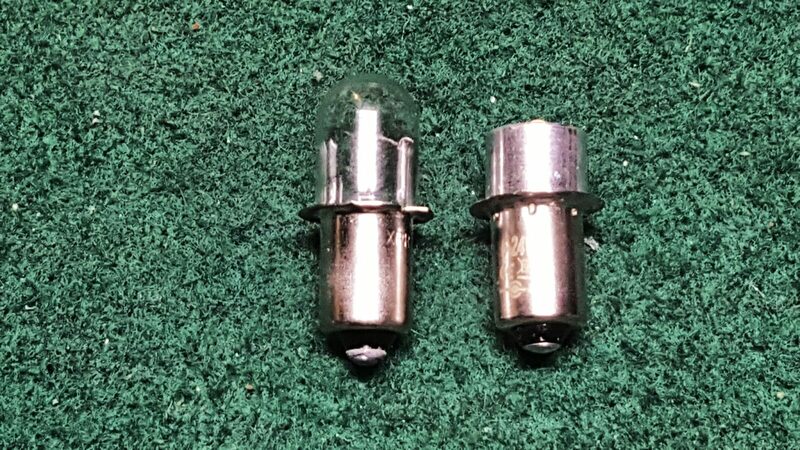 At any rate, I wound up with both my old light and my dad’s sitting next to each other and figured it was time to upgrade them and return them to service. 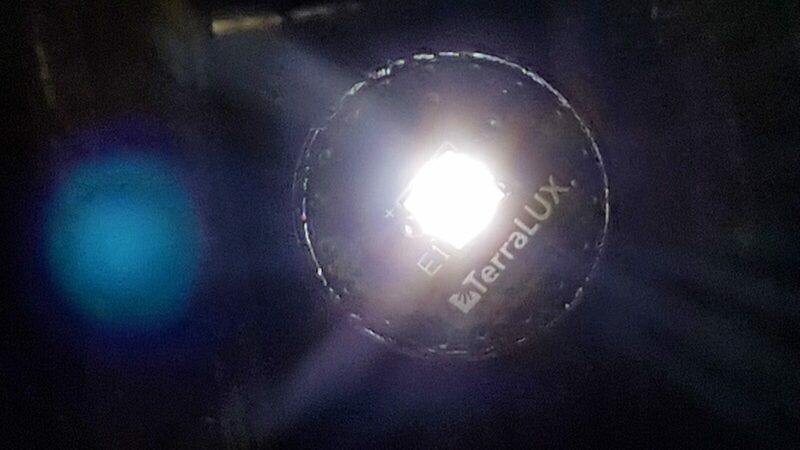 The LED upgrade is from TerraLux and is their TLE-5EX MiniStar2 Extreme. 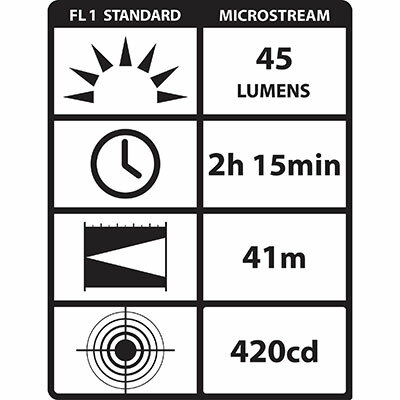 They claim 150 maximum lumens for four hours. 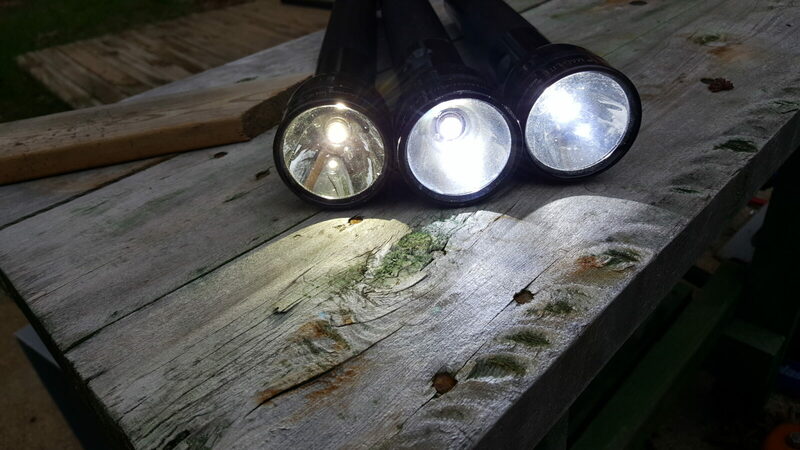 I can’t speak to the duration but they are definitely bright – brighter than my 80 and 100 lumen lights for sure with a really nice solid coverage. 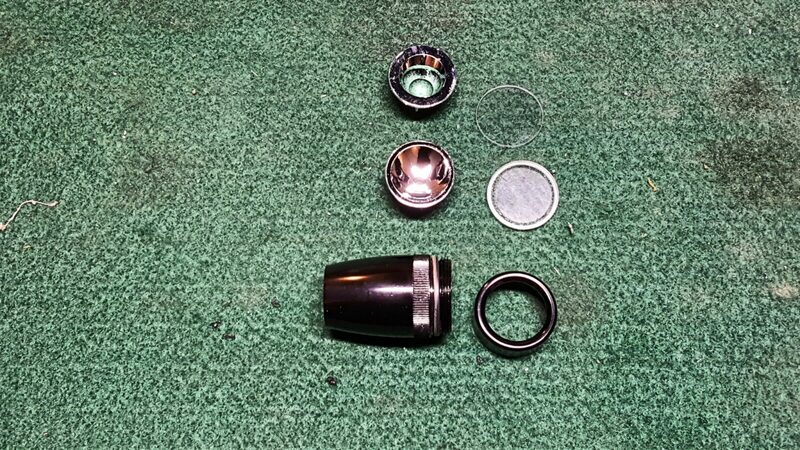 Basically, you unscrew the head from the camera body and while you are at it, remove the lens cap also because you will replace the old lens with a new one. If you see any stretched, torn or missing O-rings, then replace them while you are at it. The old bulb just pulls straight out of the body. You don’t need to do anything else – just pull it out. 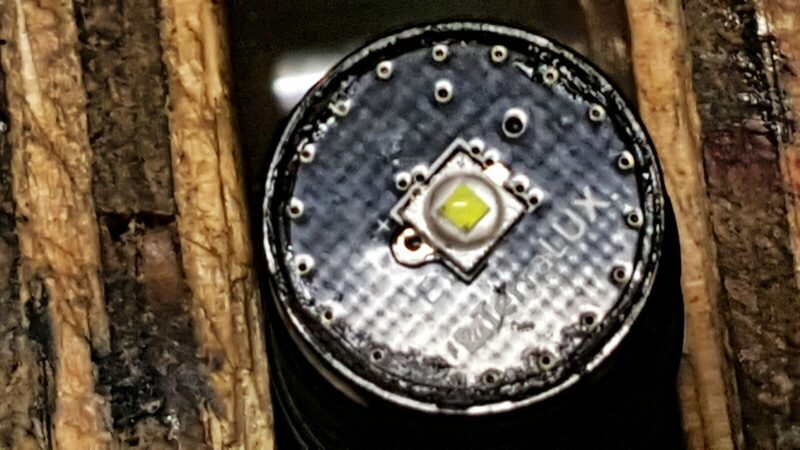 Now the LED module’s legs just go in where you removed the old bulb. Have batteries in the light because you need to find out if the module is plugged in the right way or not. What I mean by this is that the polarity does matter. If you plug the module in and it will not light then turn it the other way so the legs switch the power holes they are plugged in to. 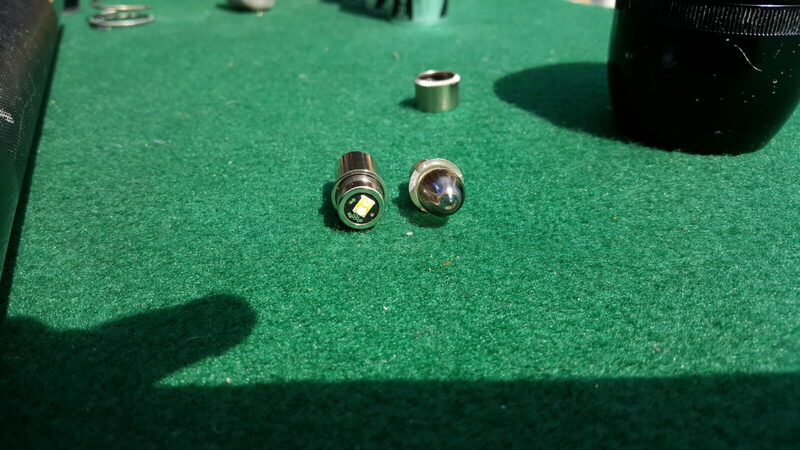 Notice how the reflector that comes with the module has a much wider hole to accommodate the LED. You can save your old bulb and reflector if you want to. The module will sit on top of the housing. I got lucky – the light worked the first try. 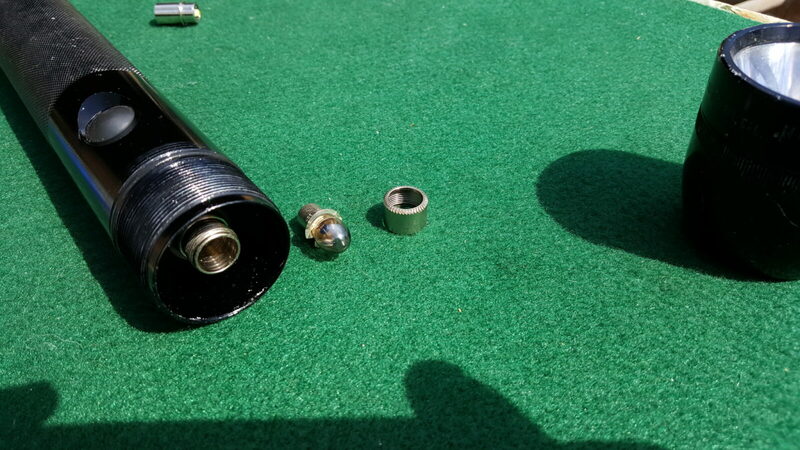 If it did not, I would have removed the module and exchanged holes the legs were going into. The tailcap has a nice switch. 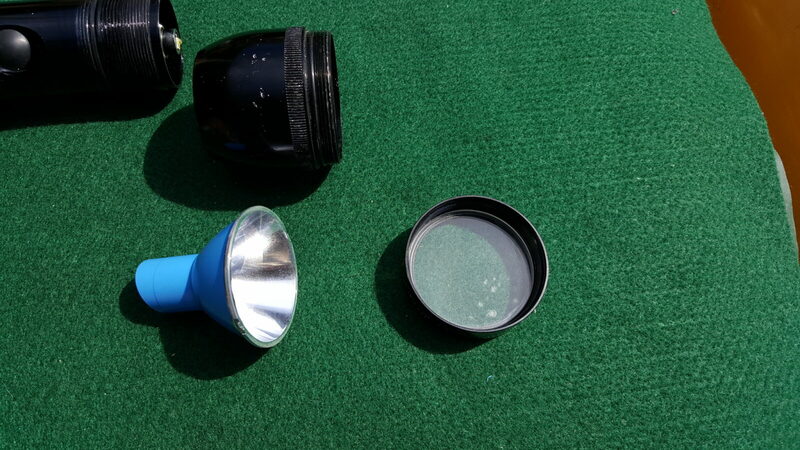 What I like is that I can adjust the lens how I want and just turn the unit off and on at the tail cap. If you were packing this, you can still turn the light off the old way and reduce the odds of it turning on. 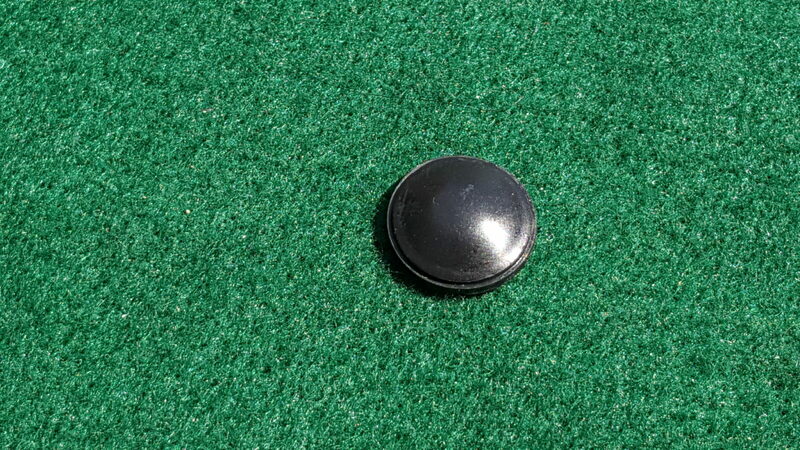 Lastly, the cap has a perk – it has a lanyard ring on the side and it will prevent the light from rolling off a surface. On one hand you can’t stand the light up and run it like candle but on the easy on/off switch and elimination of rolling are nice bonuses. So that’s all there is to it. I’d say it took me 5-10 minute per light and I satisfied my nostalgia by keeping them and have far, far brighter lights. I’ve been using one of the lights for almost two months as of writing this blog without any problems at all. 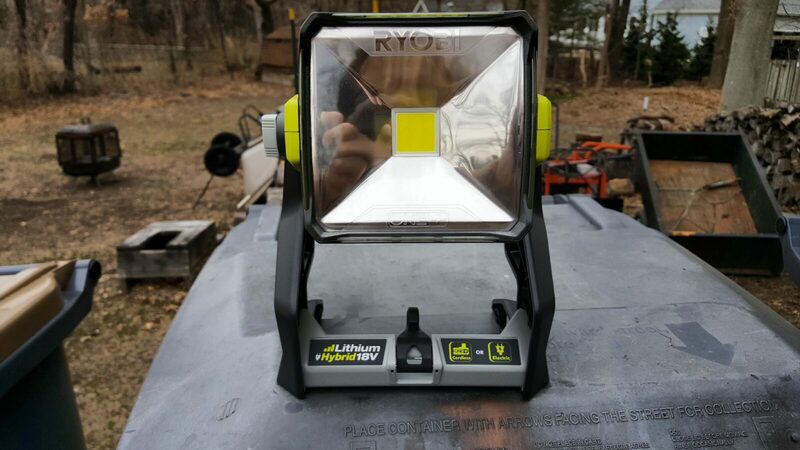 Okay, I ordered the EBLCL CE ROHS FCC PR P13.5S 18V 247 Lumen CREE XP-G2 S4LED upgrade for my 18 volt Ryobi worklight. 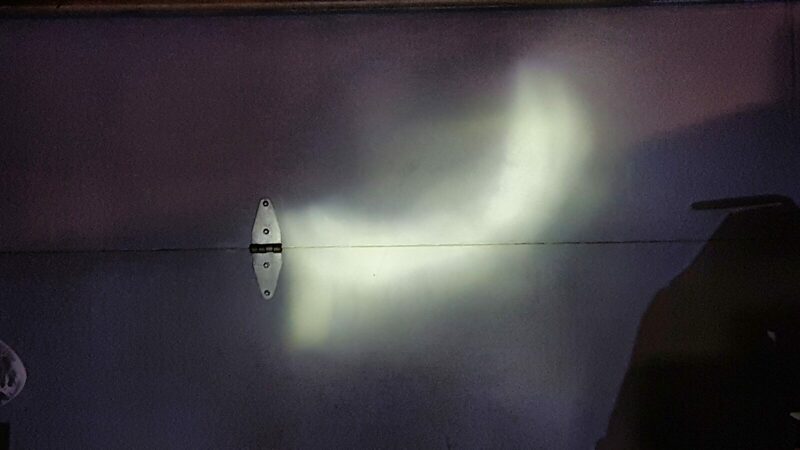 To make a long story short, like the Jomitop, it too throws an irregular crescent shaped light that I don’t like. This unit is sold by a number of vendors on Amazon so buyer beware. I’m going to just leave this unit installed and look for a new worklight … I may even just put a replacement bulb in the unit. I use these things quite a bit and I would rather have a decent wide area of light vs. these oddly shaped beams. Bottom line, unless you like the shape of the beam shown above, I can’t recommend it. 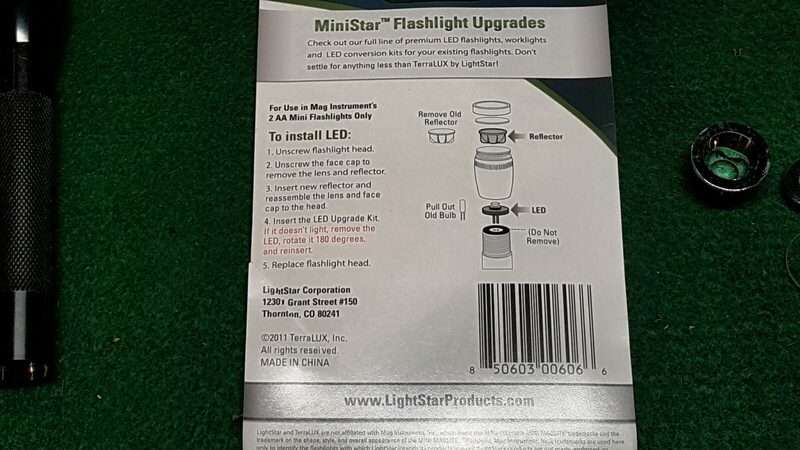 Reliable – to be honest, a lot of the “miracle” lights that are advertised are total pieces of crap. Everything from poor switches, low quality soldering and, believe it or not, weak springs that break down with use and no longer make reliable contact with the battery. When I need a light, I need a light. Acceptable Brightness – there is a trade-off between brightness and battery life. There always has been and always will be. Now LEDs have really helped push that envelope but even they have trade offs. 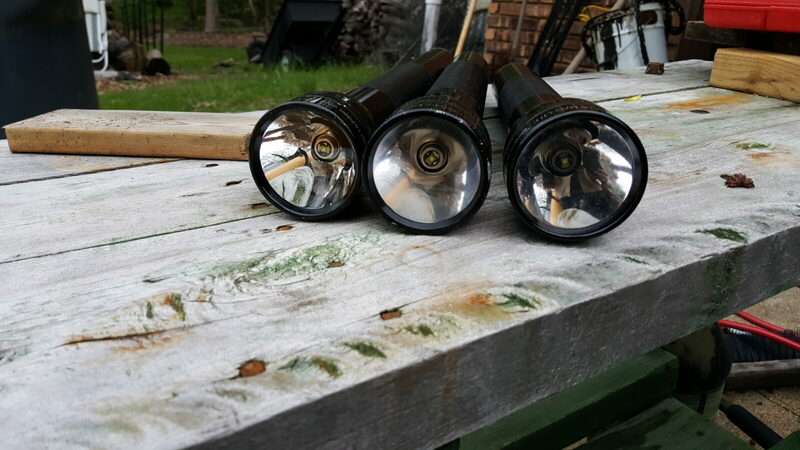 For most use, you’d be surprised just how bright 45-100 lumens really is and the cheap lights are misrepresenting about what they put out anyways. Americans especially seem to think that brighter is better. Well, for me, I really need to figure out the balance. 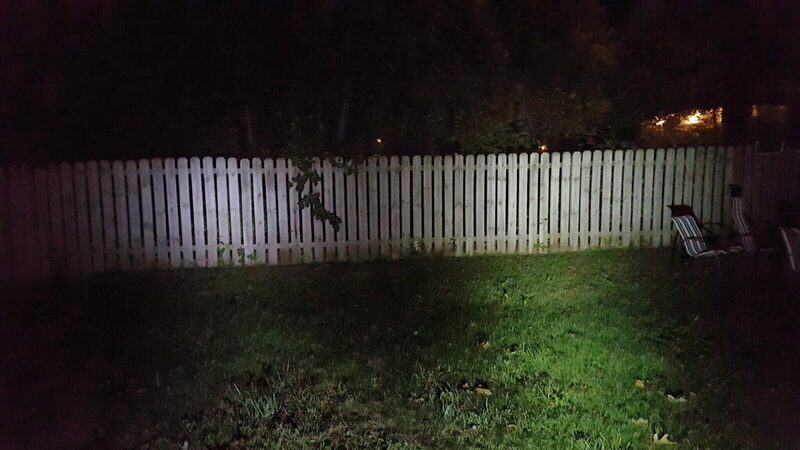 I’ve found that 45-100 lumens is pretty darned good for stuff within 100 feet. No scientific studies were done – I just walked outside and shined different lights around. Decent battery life – I needed a light where the battery would give me at least two hours of light per battery set. This magical number is based on having easy access to replacement batteries. Out in the Styx, you may find decent priced AAA batteries but not CR123As for example. 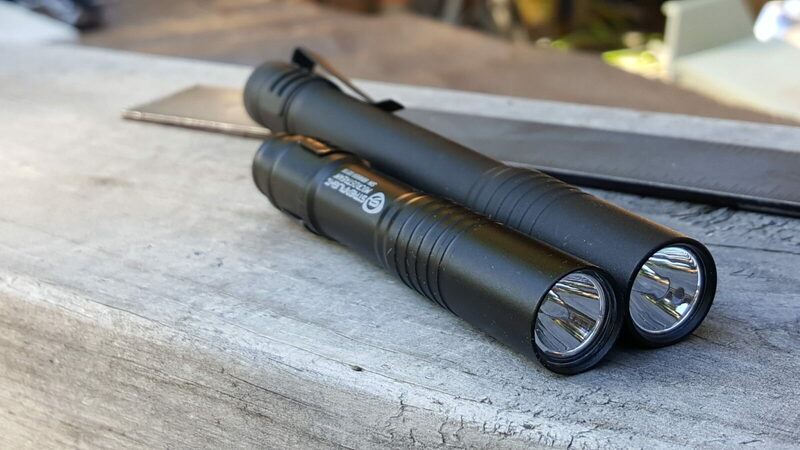 Small Size – I need a flashlight that fits in my pocket and does not weigh a ton. So, armed with this, I started digging around. 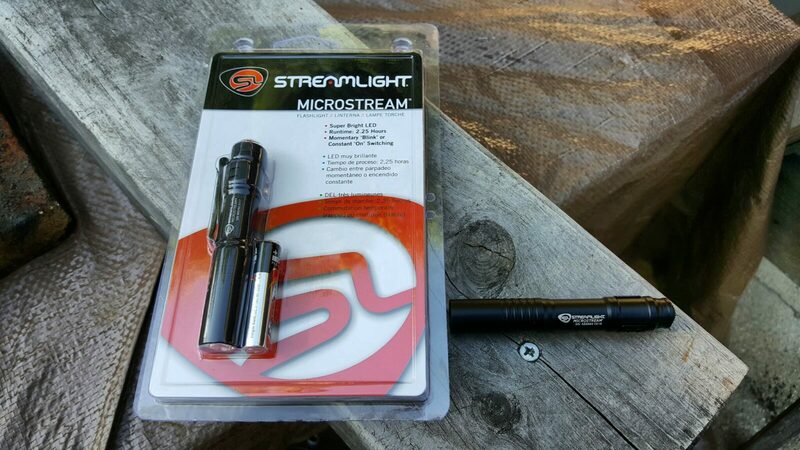 I have no affiliation with Streamlight so when I tell you I like their stuff, I actually like their stuff. 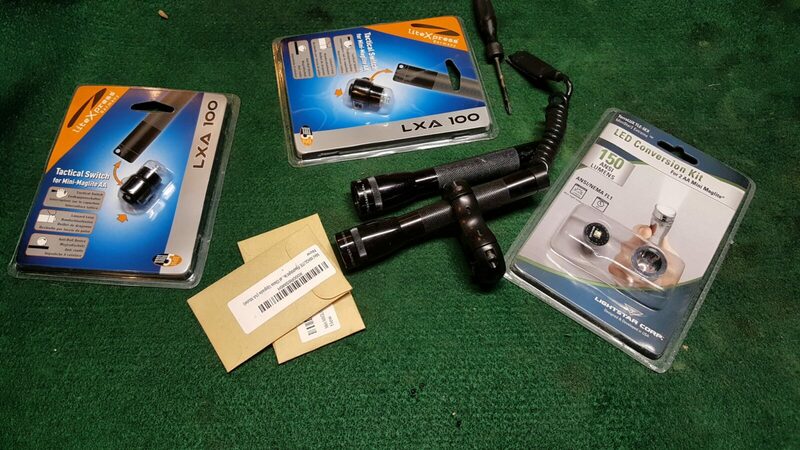 I have been using their TLR weapons lights for a number of years now and never had one fail. 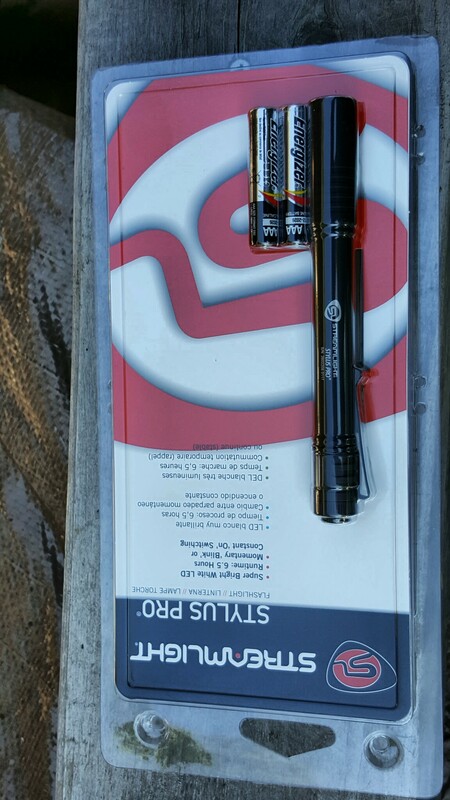 Armed with that, I started looking at their small lights and decided to get both the Microstream (single AAA battery) and the Stylus Pro (two AAA batteries) to try out. 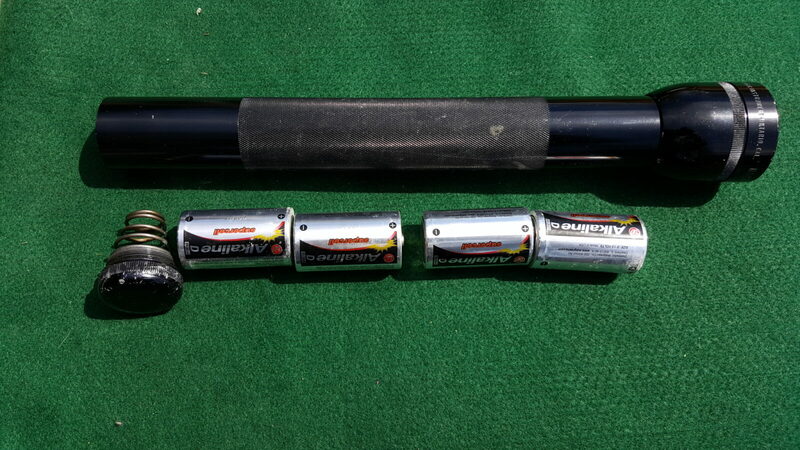 So, I installed the supplied Duracel AAA batteries and spent some time playing with both. The switches are solid, no rattles, and the light is pretty good. This is me running the lights side by side at a fence about 30 feet away. 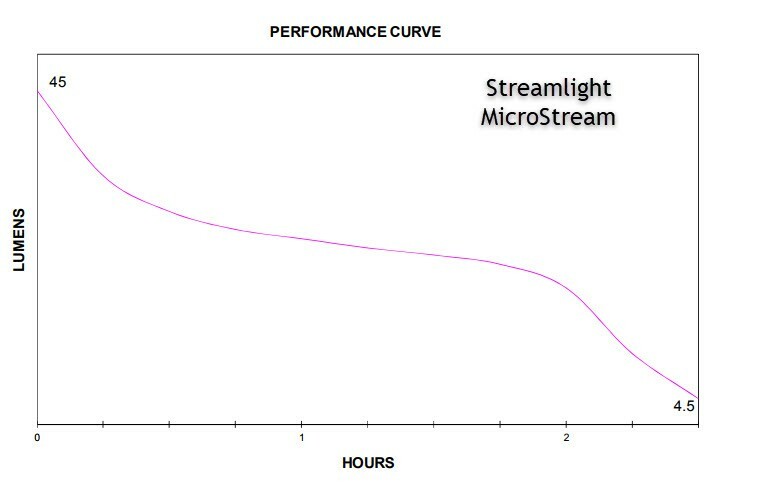 The Microstream did surprisingly well compared to the bigger light – it seems to be a tighter beam vs. more of a flood from the Stylus Pro. 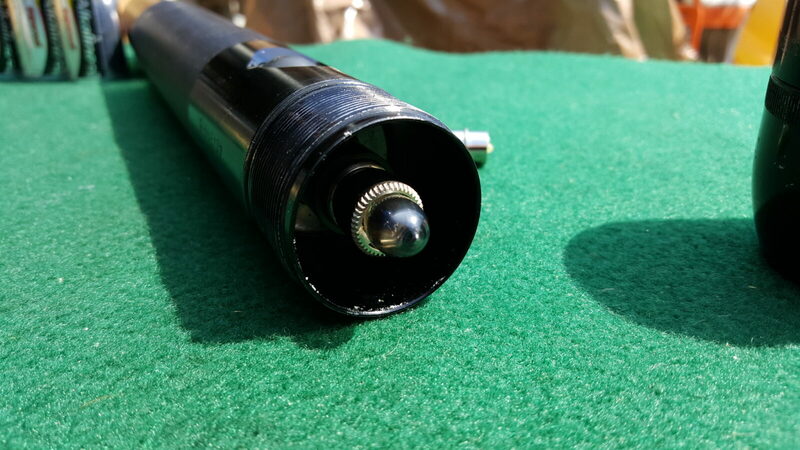 The Microstream is on the left and the Stylus Pro is on the right. Bottom line, both seem like they will meet my needs. 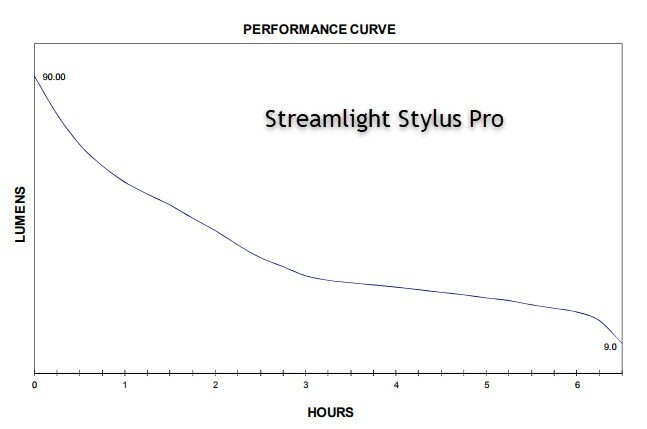 I’m going to carry the Microstream for regular use and the Stylus Pro when more light is needed for a longer time. 2/22/2018 Update: These lights have held up great. I even accidentally put one through the clothes washer without any problem -nothing happened to the finish and no water got inside! I actually have four of the little single battery Microstreams and they are pretty much my every day carry when working in the shop, travelling, etc. I actually buy what I post about so if something doesn’t work, I’m going to report it. 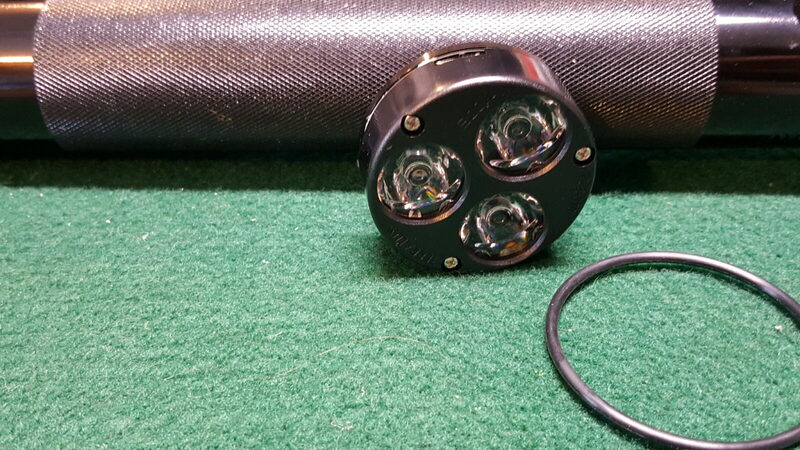 In 2015, I upgraded my three Mag-Lites with TerraLUX TLE-6EX Ministar5 140 Lumen LEDs. Those have worked great – they are bright, durable, and easy on the batteries. 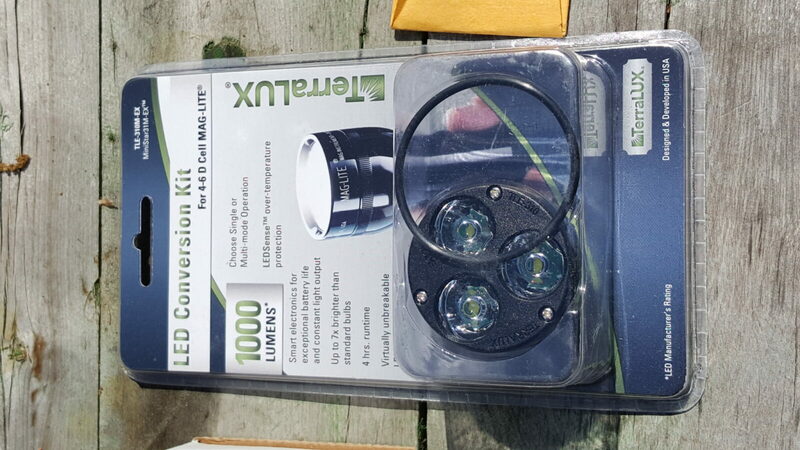 A few weeks back, I ran across an Amazon listing for a TerraLUX TLE-310M-EX Ministar31M-EX LED Conversion kit for 4-6 D cell Maglites. 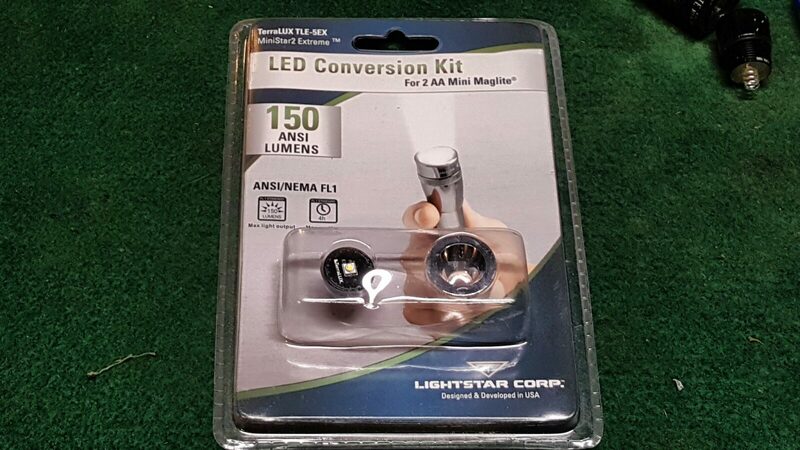 Now that kind of excited me – 1,000 claimed lumens plus I had good luck with their bulb replacements so the upgrade kit seemed like a no brainer. Unfortunately, I was not so lucky this time because it did not fit either my four or five D-cell lights. 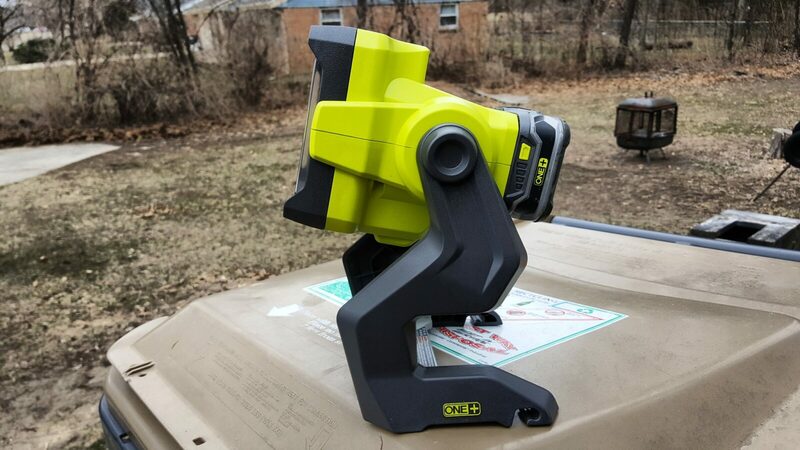 To be fair to TerraLUX, my 4-D cell Mag-Lite dates back to the early- to mid-1980s. My 5-D cell was bought by my dad for his own use shortly there after. The 3-D cell I have was bought by my dad at an unknown time. I just want to point out right up front these are older lights. To get to the point, the TLE-310M only fit the 3-D cell the way it should but it was not recommended for that few of cells plus was not as bright. 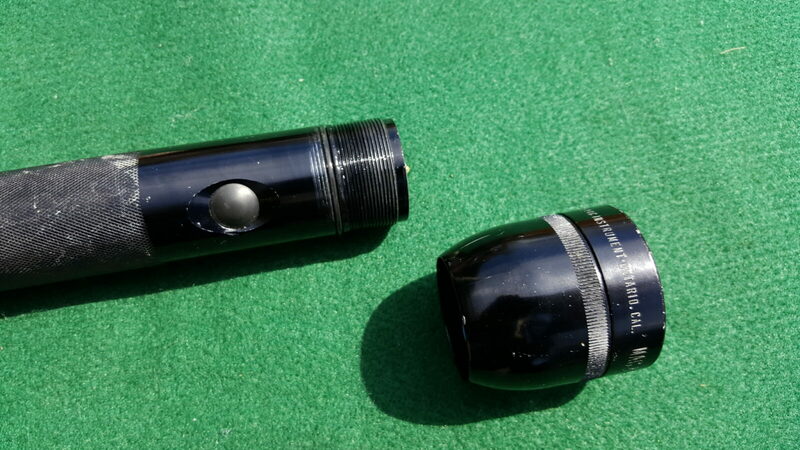 My best guess is that Mag-Lite evolved the shape of the flashlight’s heads over the years. My 4-D cell’s head actually is curved inside behind the reflector. The 5-D cell is flat inside. The 3-D is flat inside too but it look like the stem that holds the bulb sticks up further. 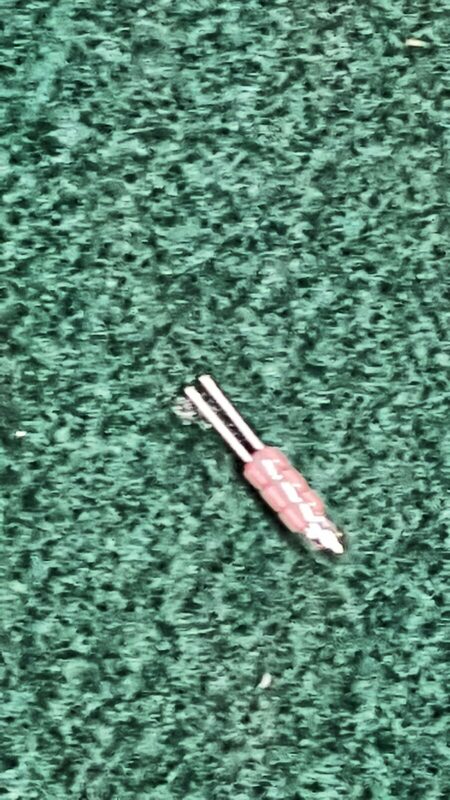 When I screwed the TLE-301M straight onto the bulb stem, WOW. On my 5-D cell, my Lux meter could not go up that high. The problem is that the kit would not fit with the head on the way it should. 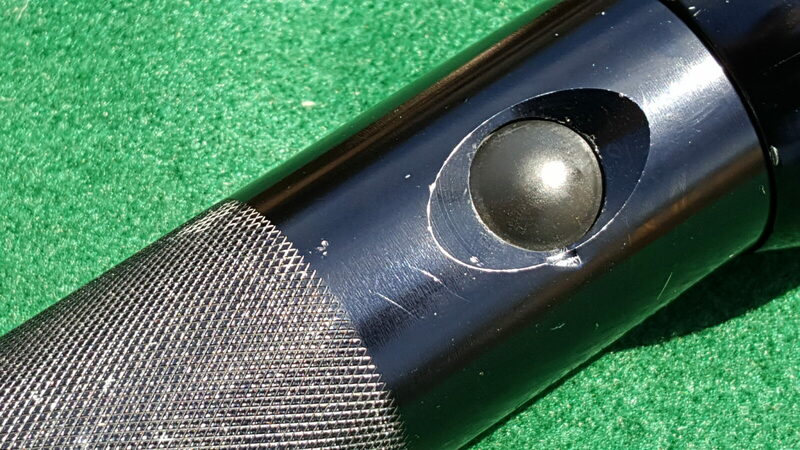 I suspect the positive contact on the bottom of the kit could not touch the Mag-Lite’s positive contact. 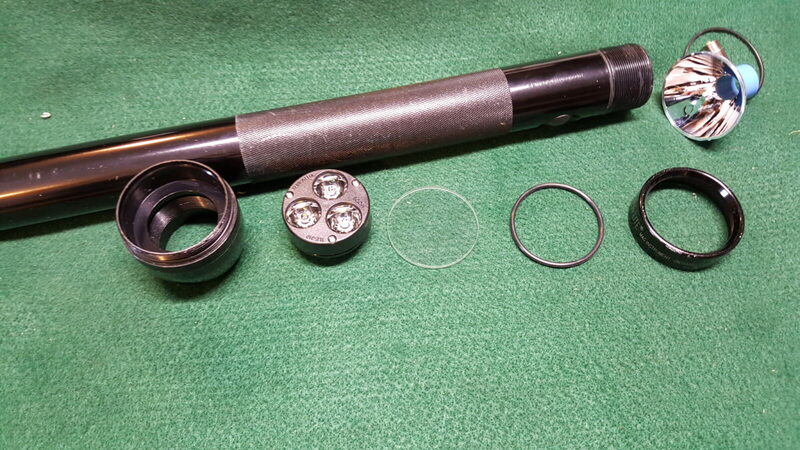 Here’s the 5-D cell taken apart with the conversion kit. 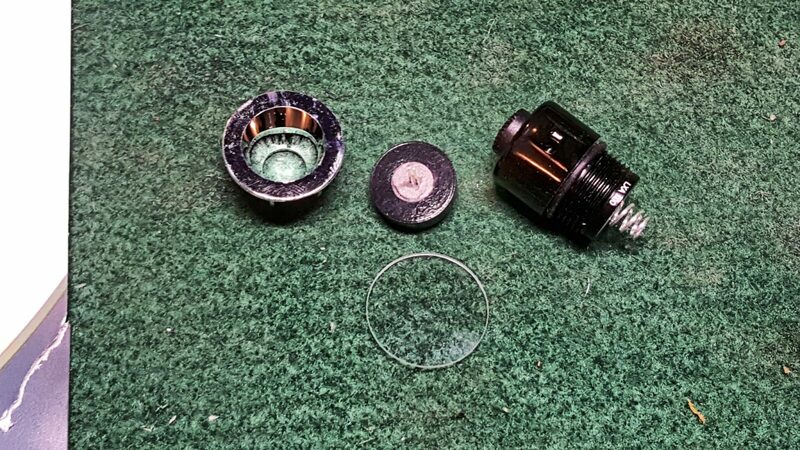 Normally to install the kit, you would just remove the bezel, lens, reflector and bulb. The kit then screws in place of the bulb. I had it all apart trying to figure out what was going on. At this point I was getting a bit miffed. 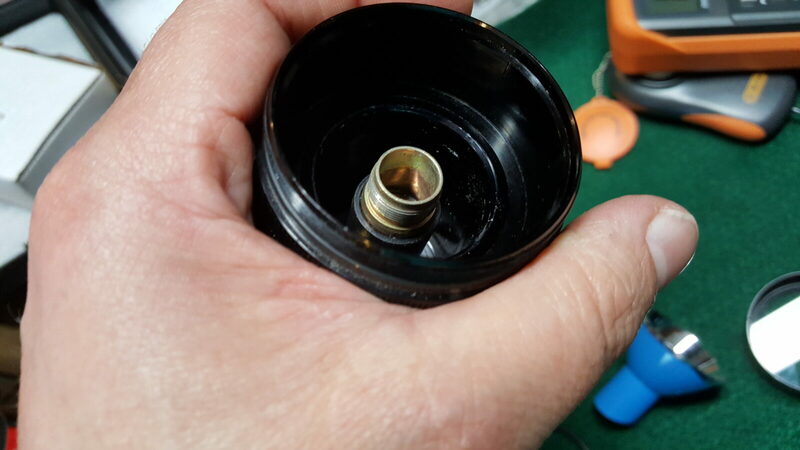 I did not take a picture of my 4-D cell taken apart but it definitely had a conical shape under the reflector and the kit again would not make contact with the head in place. if I screwed the kit right on to the stem, it was fine but no-go with the head on. Note, they say to turn the head for the kit and positive contact to come together – that did not work on either the four or five cell lights no matter how firmly I turned the head. Here is my 3-D light. Look at how far the stem is sticking up with the head on! Sure enough the kit installed just fine on that light *but* it had fewer cells than recommended and it negatively impacted the brightness. So it did almost double the light out the front but not enough for me to want to spend $50. 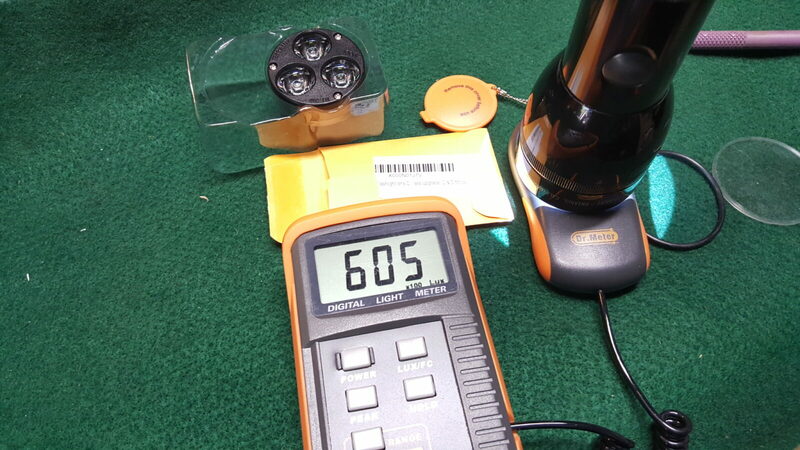 When I did the test with the 5D cell with just the conversion kit screwed straight onto the stem with no head, the output exceeded the meter’s 200,000 Lux limit. Wow – it was bright. I sure wish it would have fit. Bottom line, I returned it the conversion kit to Amazon. I feel TerraLux should have known it wouldn’t fit all lights — shouldn’t they? 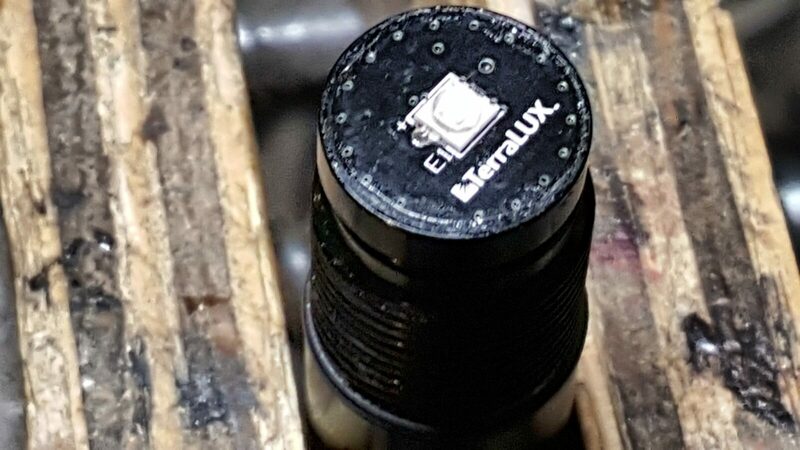 So, if you have an older Maglite (say 1980s or 90s), stick with the single bulb upgrade to LED (the TerraLUX TLE-6EX) and you’ll be a happy camper. 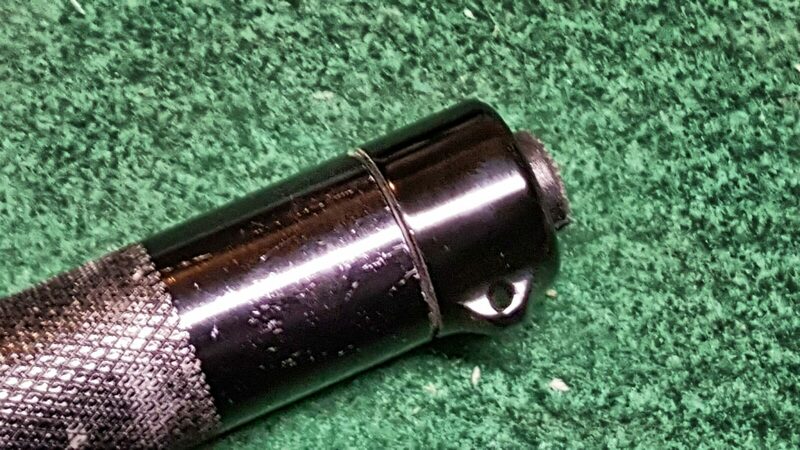 If you have a newer Mag-Lite, you may be okay but I do not know that for sure. If you find this post useful, please either buy something using one of the links to eBay and Amazon or click one of the advertisements. It will help us fund continued development of the blog. The single LED unit listed below is in use in all three of my 80s/90s Mag-Lites and works great. No problems yet of any kind! Converting 1980s-1990s 3, 4 and 5-D Cell Maglites to LED – What a difference!! 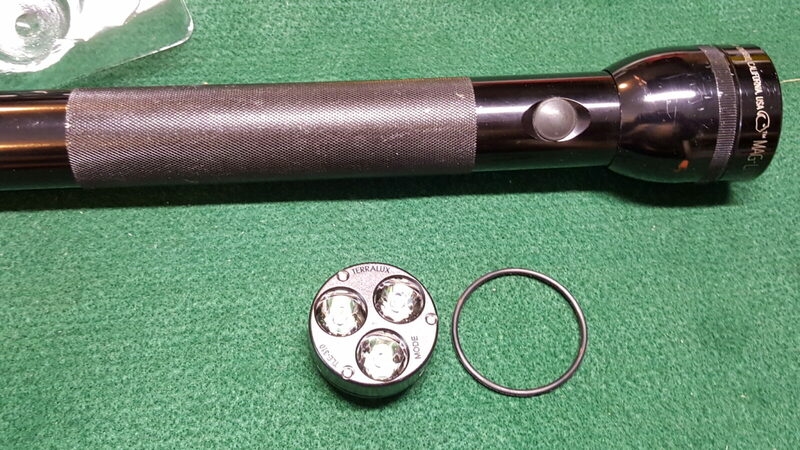 Back in about 1982 or 83, I saved my money up in high school and bought a seemingly giant 4-D cell Maglite. 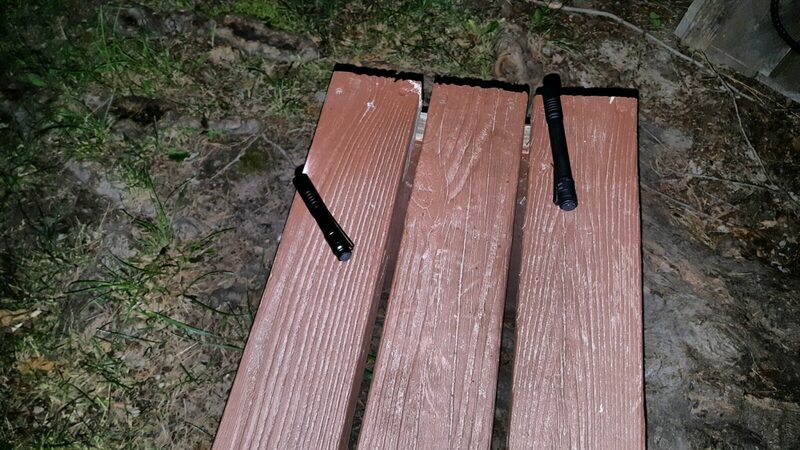 That thing has been all over the US with me – camping, in cars, trucks, by the night stand and so forth. My dad was so impressed he bought both a three and five cell version and used them on the farm. 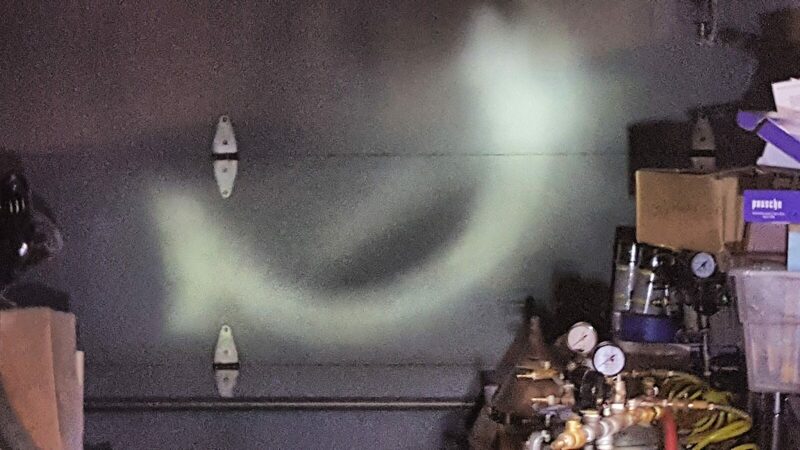 Fast forward to 2015, my dad had passed away and I had both of his lights plus my old one – the paint was chipped and the old-style bulbs didn’t crank out anywhere near the light of a modern LED flashlight but they were still operational. Face it, Maglites were built to last! My Maglight and my dad’s were just sitting on the shelf and I couldn’t bring myself to toss them. 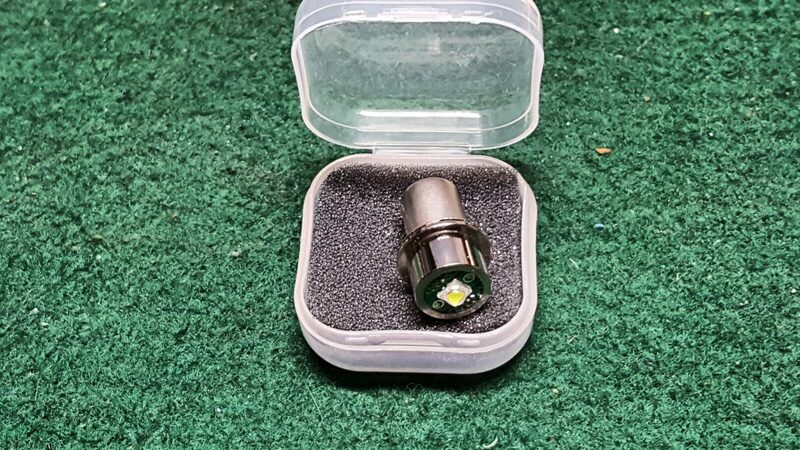 As so many things go in life, I was researching on LED upgrades for Surefire M951 weapons lights and wondered if some kind of upgrade existed for Maglites. The answer was a resounding “yes”! There were all kinds of replacement and upgrade parts available. 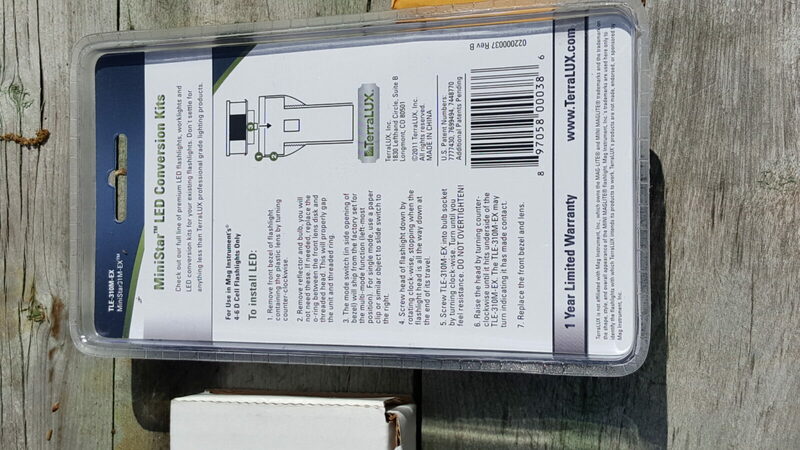 I wound up getting three TerraLUX TLE-6EX MiniStar5 140 Lumens replacement for the traditional bulbs in May 2015. Because I am writing this almost two years later, I can tell you the bulbs are a great deal – they’re not very expensive, bright as heck, durable and really easy on the batteries. I was impressed then and still am now. At any rate, two years later, zero problems, way brighter and better battery life – sounds like something worth sharing while I drink my morning coffee. Now, you unscrew the front bezel and that gives you access to the lens. I am pretty sure I tossed my original because it was so scratched up. When I upgraded the LED, I also put in a new Crystal Glass upgrade lens in. I just did it on mine and have had zero problems with it. When you take the bezel off, the lens just lifts/falls right out. There’s no glue to deal with. 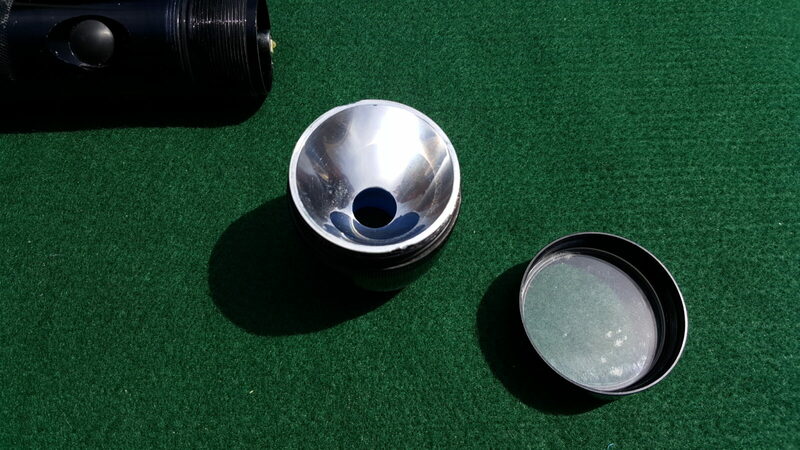 Now the lens sits in the body on a shock absorbing system. 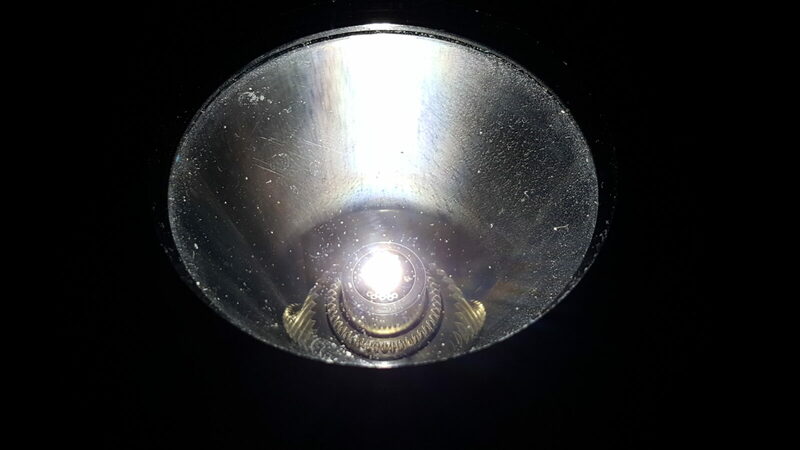 I found an old bulb and inserted it so you could see the steps. 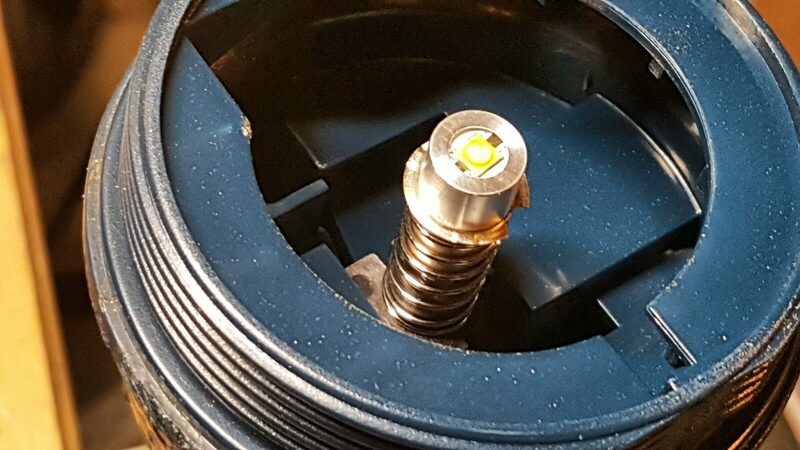 The bulb is held in place by a threaded collar that simply unscrews and you can then remove the bulb unit. 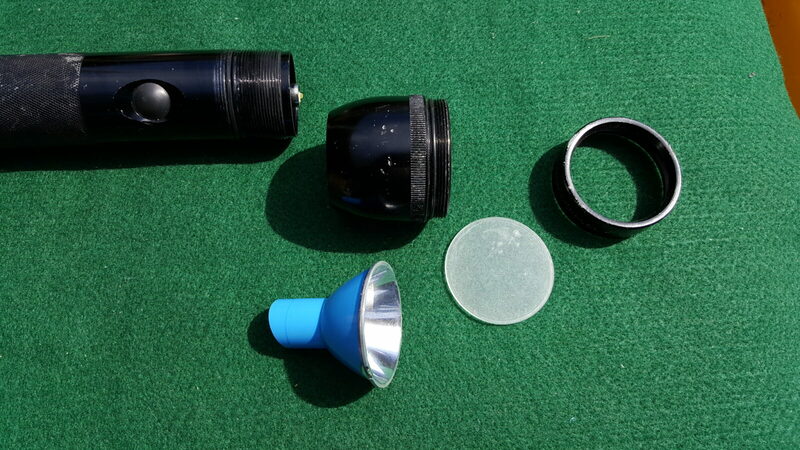 In the third and fourth photo, you can see the collar to the right of the bulb. 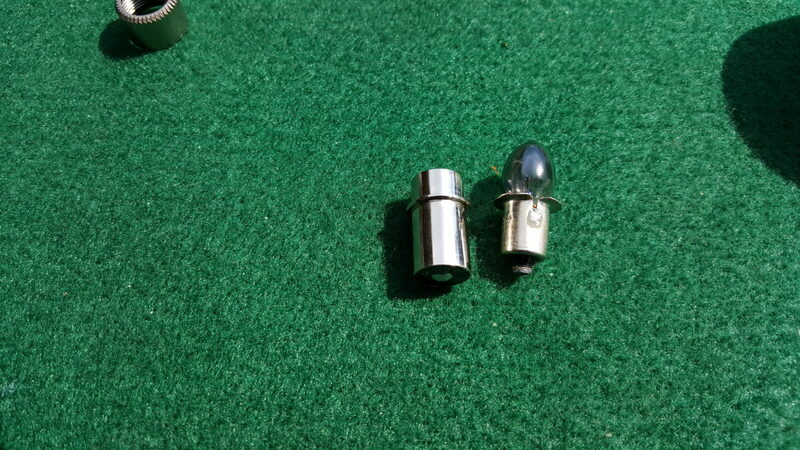 The LED emitter is a tad longer than the bulb but this doesn’t matter. Just put it in place of the bulb and then screw the collar back into place. Just snug the collar – you don’t need it to be crazy tight. 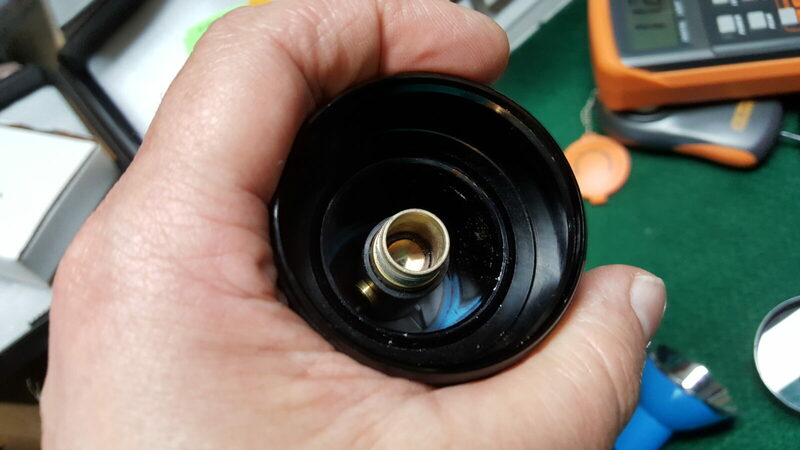 Also, I inspected all the O-Rings and out a light smear of heavy silicone grease on all the threads and O-rings to make everything turn smoothly – you can still change the beam from flood to spot, same as always. 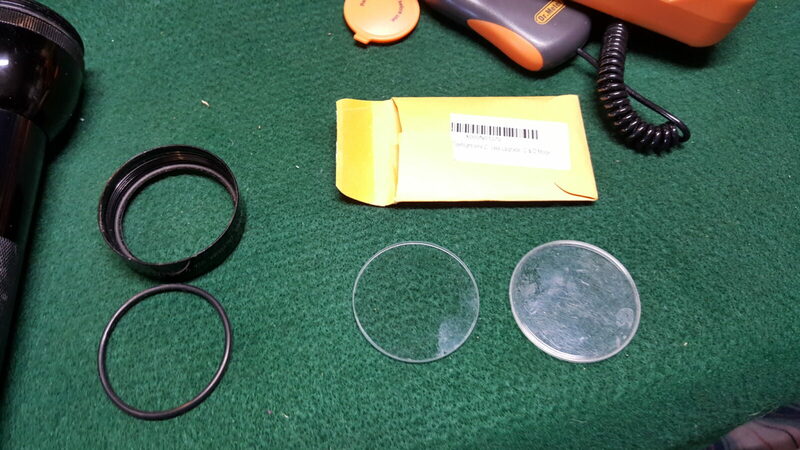 Note, if an O-ring is torn, cracked or looking bad, take it to your local hardware store and replace it. Next up, the rubber cover on my light’s switch was cracked and oxidized. You can find replacements for those as well. They are simply press fit so you can remove them very easily with your fingers or use a small tool to lift the cover up. The replacement I bought in 2015 still looks like new. The result: I spent about $30 and have a very bright durable light. I keep one in my truck and the other big light floats around between my shop and the house. In the next photo, you can see the LED emitter working. Would I do it again? Absolutely. I like being able to use these lights once again. There’s a lot of nostalgia involved with both of them. 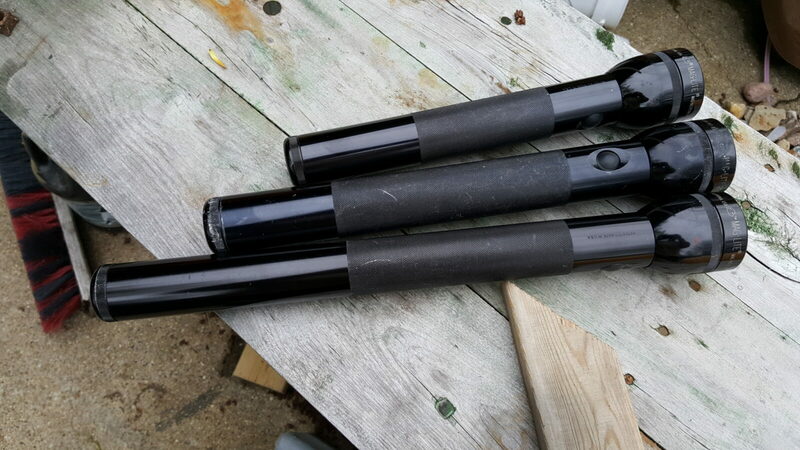 Ran across these photos of two riot shotguns I built – a Winchester 1200 I bought new in the early 1980s and a Remington 870 Express I got a good deal on from Gander Mountain in the early 2000s. One thing I learned is that the Blackhawk recoil reducing stocks really make a difference. 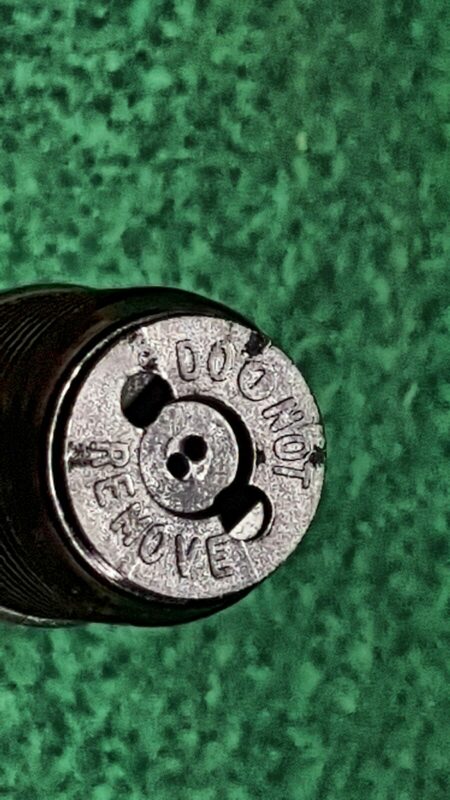 To be honest, I think Remington makes a lot cheaper guns than they used to and their quality has suffered. 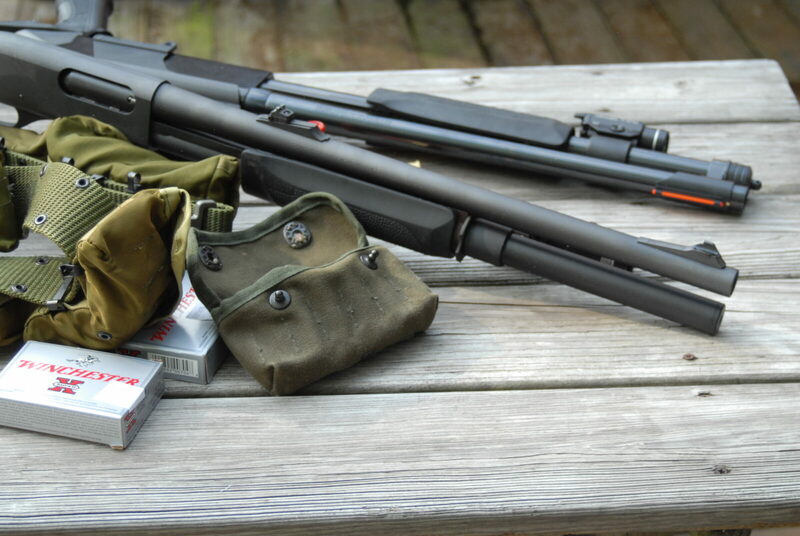 Some years back I picked up a Remington 870 express in great shape but one thing that drove me nuts was that the little orange plastic follower would spring out and jam the action. I did some quick digging and found a machined aluminum replacement that I installed and never had a problem since. Also, from a pure “keep it simple” angle, I have since stopped installing anything on a tactical shotgun other than a light. It took to long to turn on the red dot plus worries around battery life, was it still zeroed, etc. For lights and lasers, I really like the Streamlights. 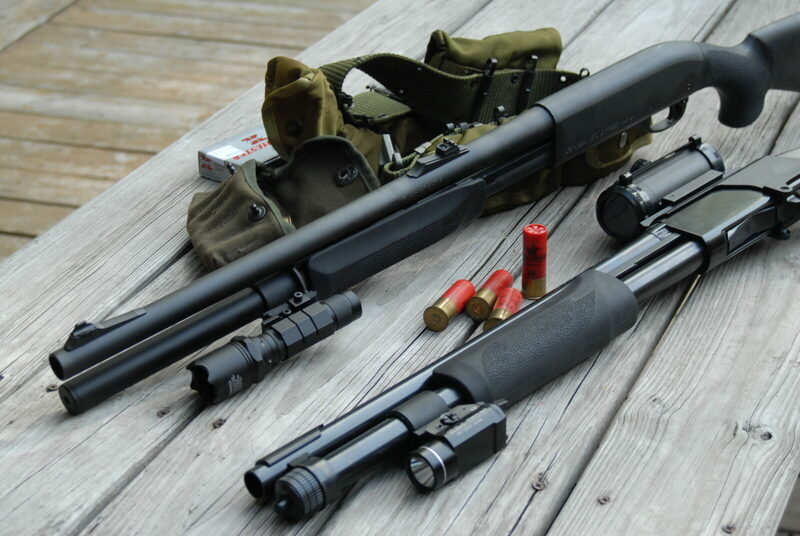 I use a TLR-1 300 lumen LED light on my home defense 870 to this day. 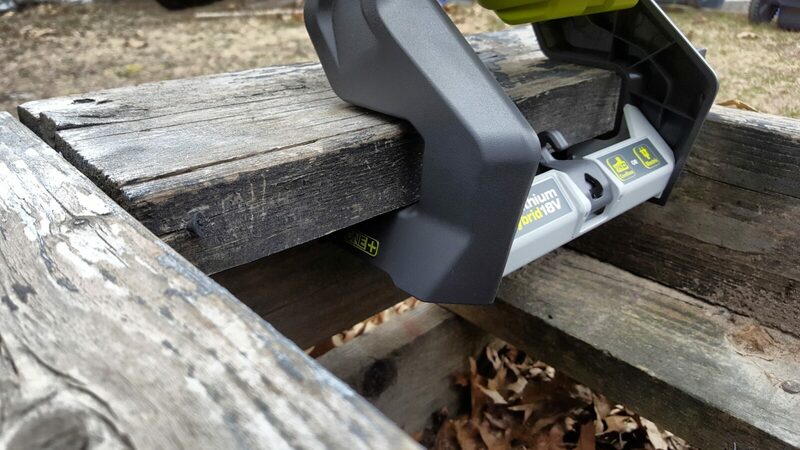 They are rugged, simple, easy to operate and durable. Having had a ton of cheap Chinese imports fail over the years, I only use proven lights and lasers on critical firearms. To save on the CR-123 batteries, read my post on that topic. The red fiber optic sight really worked out better than I thought. It made target acquisition fast. I eventually ditched the red dot optic, installed a side saddle shell holder and used just that sight. 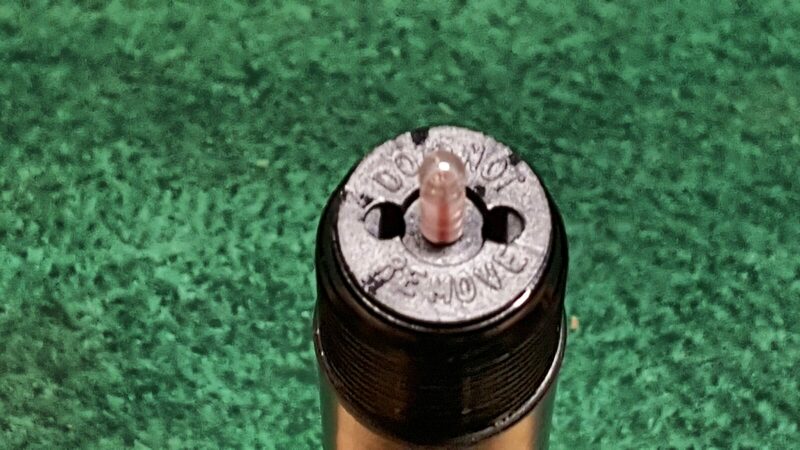 The flashlight on the Winchester was a Hellfighter with a xenon bulb. 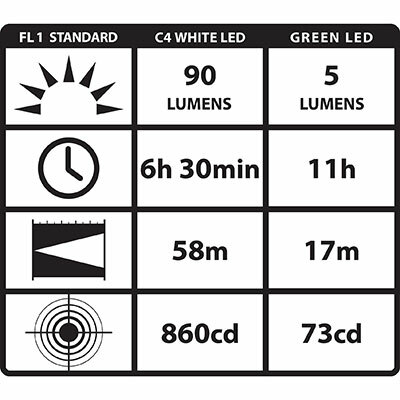 It was ok but I would only buy LEDs going forward and my preferences are Streamlight or Surefire. 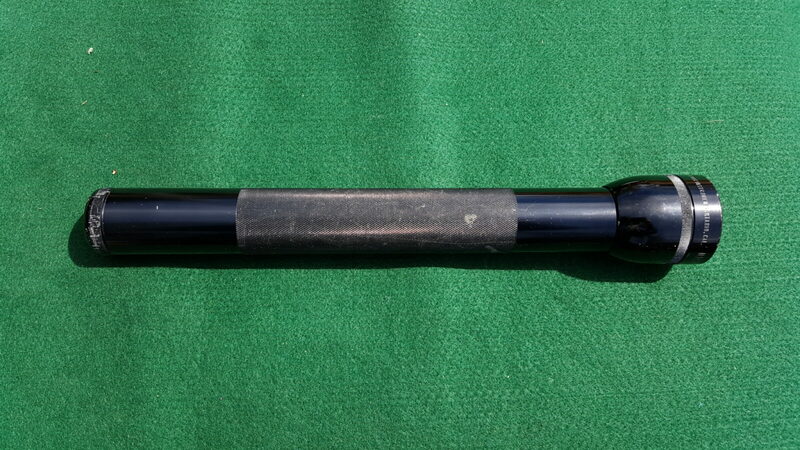 The Blackhawk recoil reducing stocks do a very good job but make sure you buy the right model. 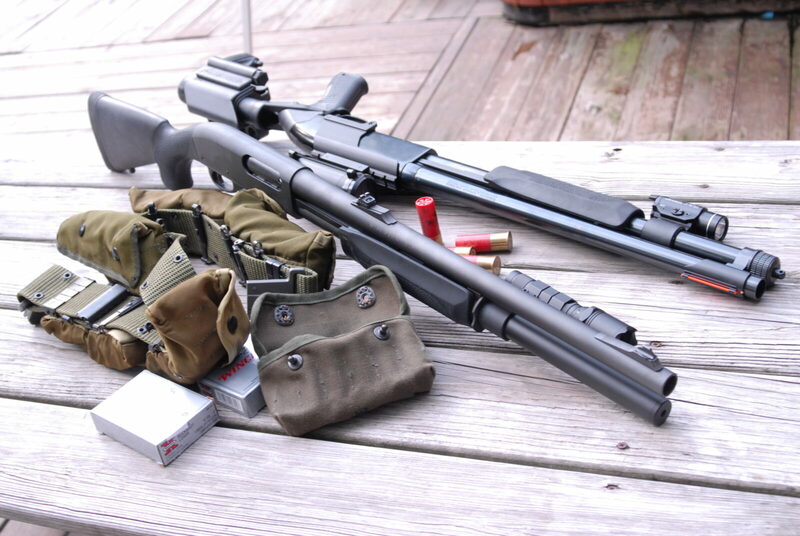 They sell stocks both with and without the recoil reduction system. 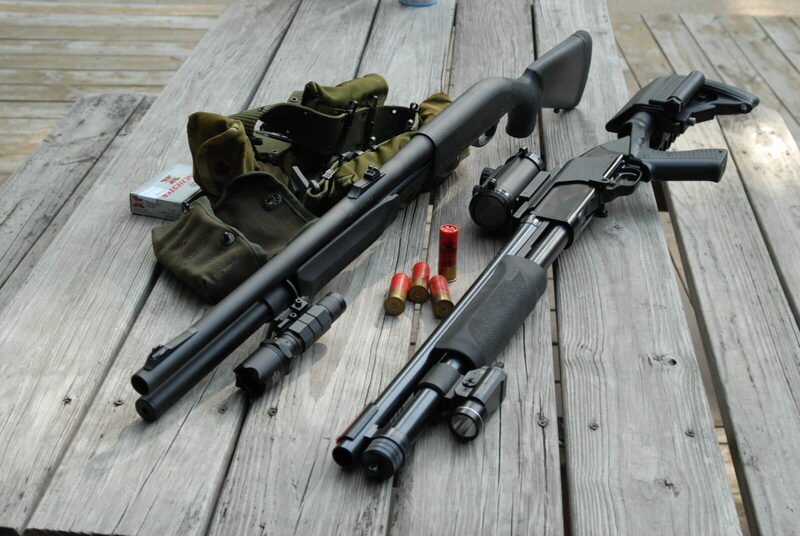 Also make sure you get the right model – they make them for Winchester and Mossberg. 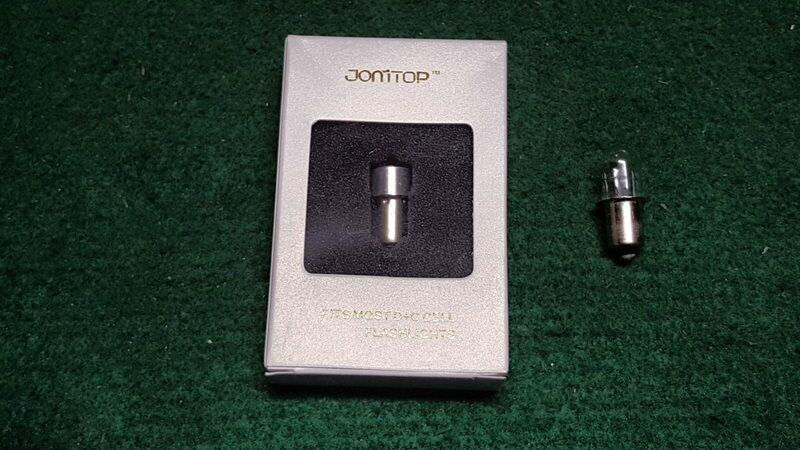 The following is an automated search from eBay so you need to double check the product and that the buyer has plenty of trades and good feedback. 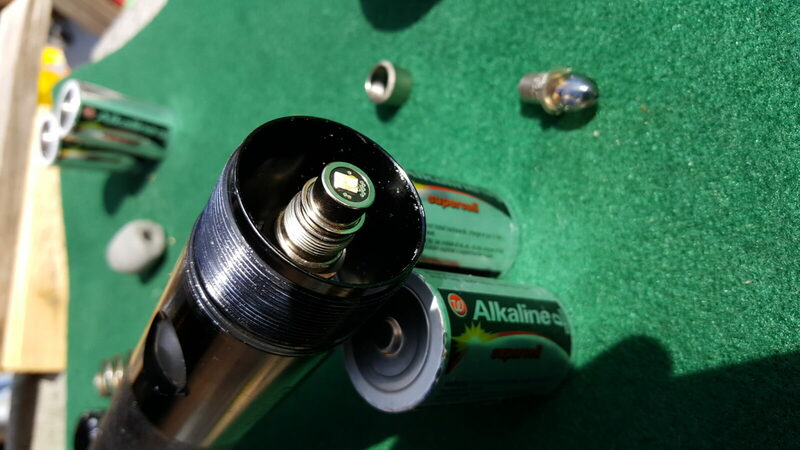 The CR123A battery is very common in tactical lights and lasers these days. I have a ton of lights that use them and think they are a great battery type and do not have to cost fortune to operate. There are two tips I want to pass along so you can safely save money. 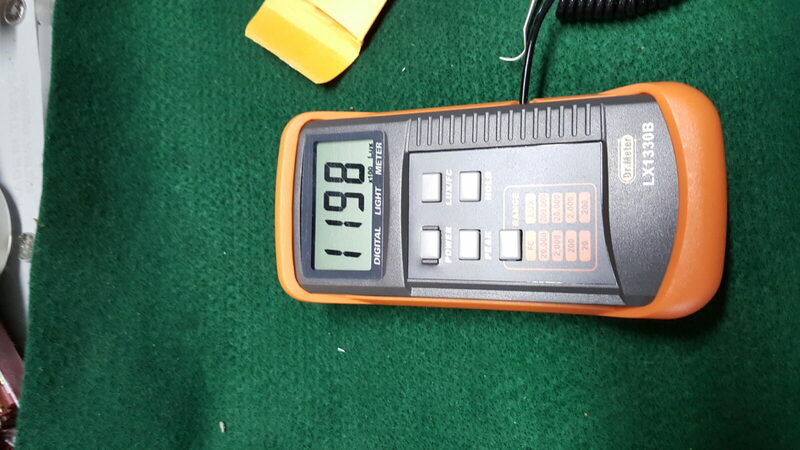 Now you might be wondering why I put it that way and it’s simple – CR123A batteries are lithium and when they are discharged deeply and rapidly, heat is generated and unless the batteries are properly made, they can literally catch on fire or even explode. 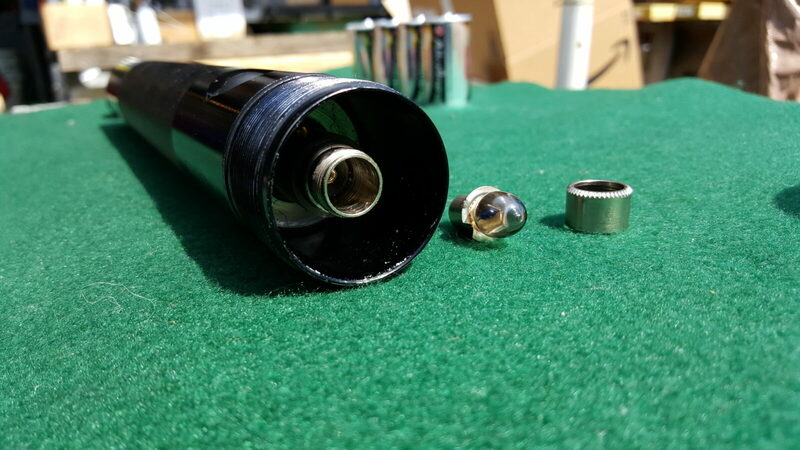 Now this tends to happen with dirt cheap batteries / no-name knock-offs and when they are used improperly such as mixing new and used batteries, types of batteries or trying to recharge batteries that were not designed to be. Useless trivia for you: CR123A is a code. CR = cylindrical. The 123 means it’s size is a ration 1×2/3rds its length of “A” cell. Put it together and you get CR123A. So, to be safe, only use name brand batteries and change them all at a time. 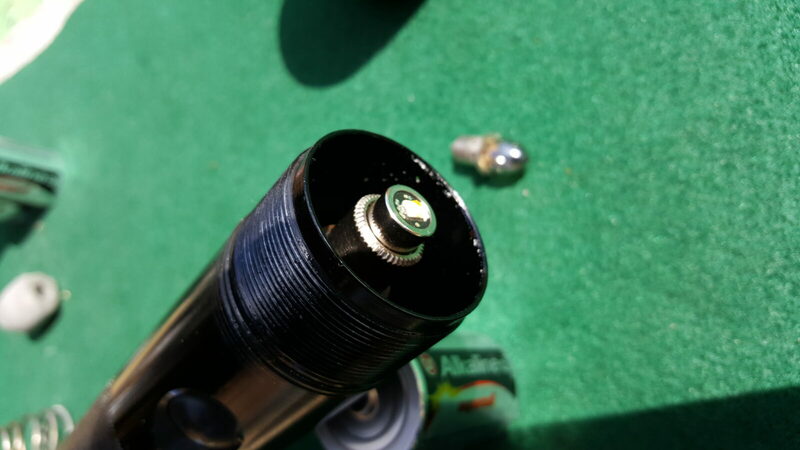 For example, if a light or laser is going dim them change all the batteries at once with new cells of the proper type and I would even recommend from the same manufacturer. I would also recommend only sticking with name brands from reputable sources. Yes, cheap knock-offs show up on eBay and Amazon so be very suspicious of deals that seem to good to be true. 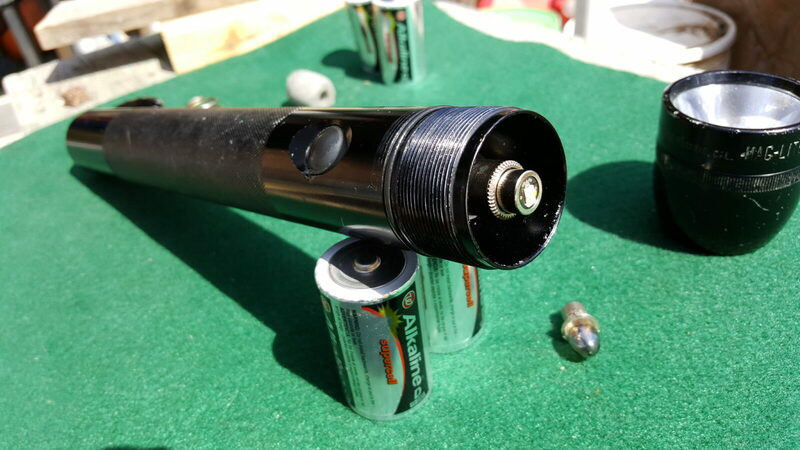 In terms of purchasing the batteries, do not go into a retail store and buy a retail package of one or two batteries in the camera department. You will pay through the nose. Instead, go to Amazon and buy Panasonic, Surefire, Streamlight or Energizer batteries in bulk packs – usually they are at least 12 batteries. You are looking for new fresh batteries that aren’t being sold cheap because they are near end-of-life. Lithiums last, or have a “shelf life” of, about 10 years from when they are made. That also means that you can afford to buy a bunch at once as they are going to last quite a while provided they are relatively new when you buy them. Why am I not recommending no-name batteries? 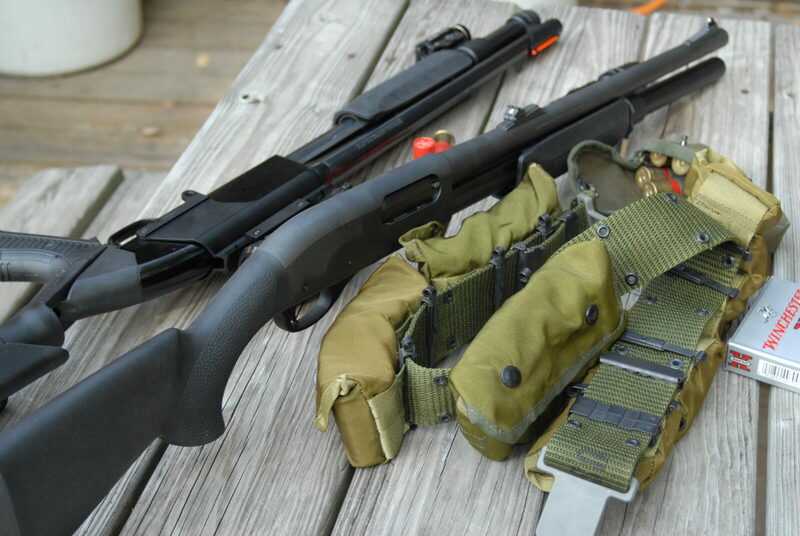 Simple – there is a reason why some of the tactical product companies say they will only warrant their products if you use certain brands – problems do happen. At a minimum, you may not get as long of life from a cheap battery built compared to something from a reputable firm. There are good niche batteries out there, but I am going to stick with the big brands. I am careful to read the description and reviews before I buy on Amazon as there are unethical sellers out there. Look for listings with lots of 4 and 5 star reviews – the more the better. Beware of listings with few reviews of any type – no telling how long they will last. 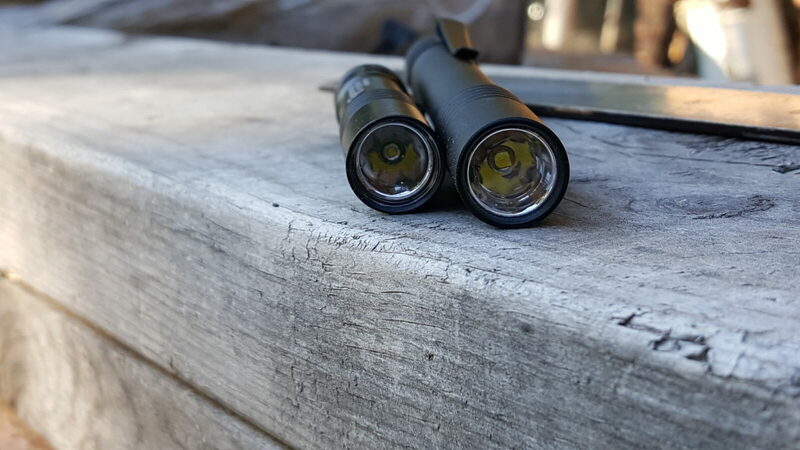 Here are some examples to help you get started and I listed them in the order of what I would select – meaning my first choice would be the Surefire batteries and the second are the Streamlights. If you just search for CR123A batteries on Amazon, you will see a ton of products for sale with different brands, quantities and so forth. Shop smart and you’ll save big time. I hope this helps you out some.